Mary Ludwig was born on October 13, 1754. Her father was a dairy farmer. His name was John George Ludwig. He came to America from Germany around 1730. His dairy farm was near the town of Trenton, New Jersey. Mary's mother was named Gretchen. Mary lived and worked on the farm with her parents until she was fifteen years old. In 1769 Mary’s father found a job for her. She became a servant in the home of Dr. William Irvine. Dr. Irvine lived in Carlisle, Pennsylvania. His home was over 100 miles away from where Mary grew up. Mary’s job included washing clothes, cleaning the house, and taking care of the children. With this job, Mary could send money home to her parents. In Carlisle Mary met a barber whose name was John Caspar Hays. Mary married Mr. Hayes on July 24, 1769 at the Irvine home. The Revolutionary War started in 1775. In December of that year John joined Proctor's First Company of Pennsylvania Artillery. He enlisted again in 1777. This time he joined the Seventh Pennsylvania Regiment. John was in the artillery. The artillery is the section of the army that fires weapons. His job was to “serve” a cannon. He hauled the cannon balls to the cannon, stacked them up, and loaded them into the cannon. He aimed and fired his cannon. He cleaned it out between shots. He also made the cartridges of gunpowder that were used to fire the cannon. When John Hays joined the army, Mary decided to go with him. She became a camp follower. Camp followers were women, men, and children who followed after a group of soldiers. They helped by carrying bundles, cooking for the soldiers, mending and washing their clothes, and caring for the sick and wounded. By 1778 the war was not going well for the British. They decided to pull out of Philadelphia, and take all troops to New York City. When General Washington heard about this, he sent troops to New Jersey to attack the British. John's regiment was sent to Freehold, New Jersey. Here they fought the British. The battle is called the Battle of Monmouth in the history books, but it did not really happen in Monmouth, New Jersey. It really happened in Freehold, near the Monmouth County Courthouse. During this battle John worked hard, firing his cannon. It was a very hot day. Mary made many trips to get water for the thirsty men. She carried water back to the soldiers in a pitcher. 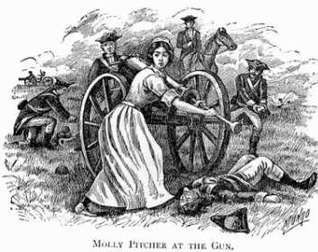 The men started calling her “Molly Pitcher.” It was so hot that John collapsed next to his cannon. Mary took his place. She loaded the cannon just as he had done. A soldier named Joseph Plumb Martin was also in the battle. Later he wrote about what he saw. He said that while Mary was loading a canon during the battle, she was standing with her feet spread wide apart. A canon ball shot between her legs. It tore off the bottom of her petticoat. Mary was not hurt. Tradition says that George Washington saw Mary on the battlefield, helping to fire the cannons. It is said that he spoke to her after the battle and thanked her for her bravery. Legend says that he made her a sergeant, but this cannot be proved. The Battle of Monmouth was one of the last major battles of the war. After the battle John Hays rested and got better. When John was allowed to leave the army, he and Mary went back to Carlisle. Mary had a baby boy in 1783. He was named John L. Hays. In 1788, when young John was five years old, his father died. After a few years Mary got married again. This time she married a man named John McCauley. He had also fought in the war. It was not a happy marriage. John McCauley died in 1813. Mary was a short woman who often wore a white dress covered by a striped skirt. This skirt was split in the middle and gathered to each side. She also wore a white cap with a broad frilled edge. She loved to talk. She had learned how to swear in the army, and sometimes she spoke her mind in a blunt way. Mary had worked as a servant while her second husband was alive. After his death she continued to do the same work. She served several families. One was the Miles family. She took care of their two sons, and nursed Mrs. Miles, who died in 1822. It is said that she loved children. She was a kind and careful nurse. Many of the soldiers who had fought in the war had very little money after the war. The same was true of the widows of men who had died in battle. The government decided to give money to these brave people. The money was called a pension. Mary was given a pension of $40.00 per year. She asked for the pension because she was the widow of a soldier. The pension was granted on February 21, 1822. The pension was not granted because of John's work. It paid Mary for what she had done. The act said that the money was given because of "her services during the Revolutionary War." Mary spent the last years of her life living with her son John in Carlisle. John and his wife Elizabeth had seven children. Mary died on January 22, 1832. She was 79 years old. She is buried in Carlisle. Mary’s grave in the Old Graveyard in Carlisle has a stone marker on it. There is a battle monument in Monmouth, New Jersey. On it is a picture of Mary with a pail of water and a cannon.